Home improvement technologies are creating sustainable living spaces that help save the environment. Two of the more recent advancements in shingles and siding not only protect your home, they can even provide it with all of the energy you need throughout the year. It's worth your time to learn more about these two high-tech building materials and why they should be part of your next home improvement projects. Transition. When the sun strikes a semiconductor layer, electricity is generated and then transferred in to your home's electrical system. Costs. Costs for materials and installation run between $10,000 and $14,000, minus the tax credits you'll be eligible to receive and the money you'll be saving by not purchasing energy. Buyback. Once your solar shingles are operational, the power company will actually buy a portion of the energy that your home produces, giving you a passive income stream. Sturdy. 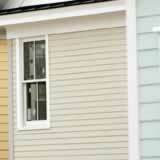 Smart siding increases the R-value by up to 22 percent. It also provides added strength and rigidity. Stylish. Available siding options include a double 6-inch and a single 7-inch clapboard, both with a rough cedar texture. Silent. Enjoy a reduction of exterior noise and an enhancement of interior acoustics. Keep in mind that these two building material technologies may incur a substantial initial cost; however, the investment is likely worth it in the long run. You can recover the costs many times over with free energy and reduced maintenance. Check with your local home improvement expert for more information on how to make solar shingles and smart siding a part of your next home improvement project.